Bathroom Renovation Stage 14: FINISHED! I just looked up my first post about our bathroom renovation and was shocked that it was almost exactly 1 year ago! Wow! I doesn’t feel like it’s been a year. I guess that’s partly because we had a usable toilet almost the whole time, a usable shower after 5 months (the most labor intensive part of the project) and a usable sink and vanity after 8 months. New door installed between the bathroom and laundry room. Baseboards on, caulked and painted. Our hope for this room was that it would be a totally relaxing spa-like space. See all of my bathroom renovation posts here. I believe I owe you a bathroom update! Sorry it’s been a while. Things have been slowly and steadily moving along in our master bathroom renovation. We have a light above the vanity. We have tile backer on the floors. We have a towel rack on the wall. We have robes, toilet paper and art hanging on the walls. We have a second shower head (half) installed. It’s not actually attached to the plumbing yet. But it looks pretty doesn’t it? My husband is amazing! (But you knew that already if you’ve been following my blog.) We’ve both been quite busy lately which is nothing but a blessing when you’re self-employed (Jason) or do freelance in addition to your day job (me). And our weekends have been filled up with fun, work and social obligations lately. Also a blessing. However, the bathroom renovation had almost come to a complete standstill since we (mostly) finished the shower. We’ve both be itching to get the renovation wrapped up but most of the remaining things I have no idea how to do and/or I’d rather trust Jason to do. This past week he has been working hard to find time through the night or during a gap in his daytime work. Electricity has been run to the shower light, shower fan, and the light above the vanity. Check out this sweet 3 switches in 1 thing. (What’s it called again!?) Saved us (Jason) from having to cut out a bigger hole in the wall for a new electrical work box. Electricity has been run to a light in the laundry room (I still can’t believe I have a laundry ROOM! ), an outlet in the laundry room and an outlet by the sink in the bathroom. Lights installed … almost. The ceiling light that was formerly in the bathroom, which was once a bedroom, is now dangling a foot from the ceiling in the laundry room. So helpful when I’m doing laundry at night! Also, there is a light in the bathroom now, above the vanity, but it’s essentially just a light bulb hanging out of the wall. Better than the floor lamp we’ve been using! Holes in the ceiling have been patched up. Moving lights around and taking down walls created several big holes in the ceiling. Jason’s been patching and matching the lovely (not) spiky texture. Again, MY HUSBAND IS AMAZING! We haven’t had to hire help for any step of the process so far. He’s quite the electrician! Soon we’ll find out how much of a plumber he is! Well, 95% done anyway. We’re eventually going to install a 2nd shower head—a rain shower mounted to the ceiling. But that’s a little further down the priority list. Most importantly, the shower is now functional. Sunday we went shopping for shower curtains and it was SO much more fun than shopping for thin set and grout and tile sealer. Since we don’t have the 2nd shower head yet, we have some plastic bags stuffed into the hole where the controls will go. Classy, huh? Despite the plastic bags and the yet to be painted walls, that first long hot shower on Sunday night was so glorious! Tomorrow you’re welcome to give your opinion on our paint color choices. 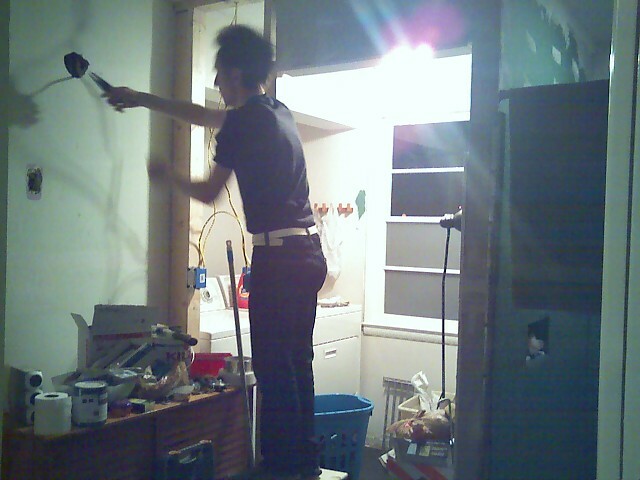 You have searched the myMCMlife.com blog archives for ‘bathroom renovation’. If you are unable to find anything in these search results, you can try one of these links.